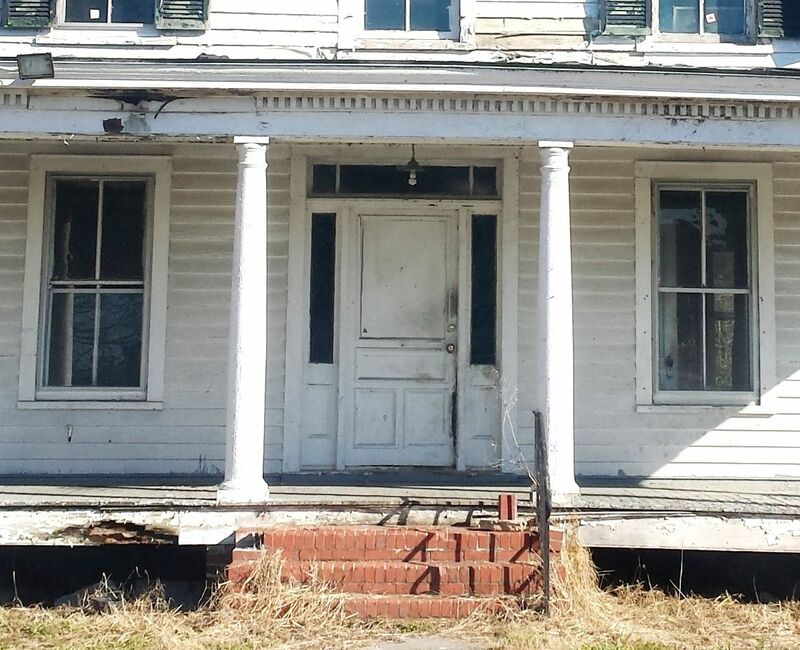 Local Arts Center buys 105-year-old house in historic river town of Mathews, Virginia. After a careful analysis, officials of this Arts Center determine that the old house they bought is an old house and must be demolished. “Thou shalt not destroy good old work” is the first commandment in old house ownership. The Bay School Community Arts Center paid $80,000 for the L. M. Callis house in March 2015, for the purpose of expanding their enterprise. When the property (and its one-acre lot) was purchased, the Gloucester-Mathews Gazette-Journal ran a nice article, where they quoted Arts Center Business Director Debbie Brown as saying that there were “many ideas” for the best use of the house and land. A subsequent article which appeared this week in the Gloucester-Mathews Gazette-Journal (February 17, 2016) said that the Bay School Community Arts Center was now planning to demolish the house. Arts Center spokesman Kelsey Desmond said it was a “difficult decision” made after they realized that the house needed insulation, roof repairs, plumbing upgrades, and heating and air conditioning systems. Plus (and maybe this was the straw that broke the camel’s back), the house had several broken window panes. 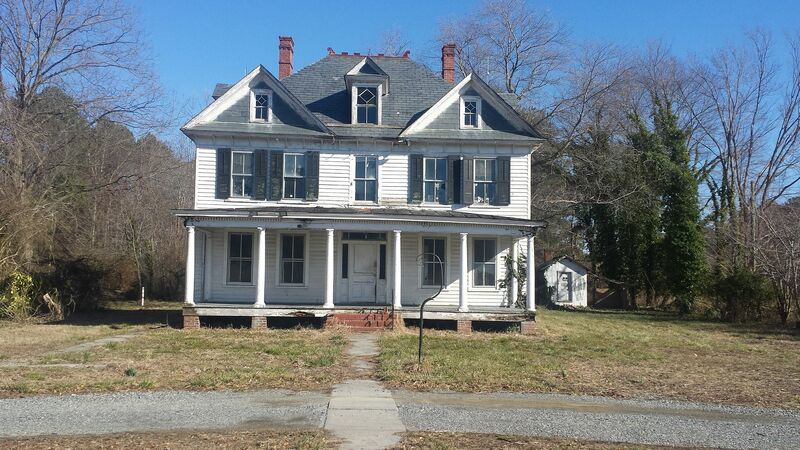 Every now and then, Norfolk Historian Bill Inge does a program called, “Lost Norfolk” which features dozens of pictures of the most beautiful old houses and buildings which are now gone, thoughtlessly demolished in the dark name of progress. At each slide, the audience first gasps and then sighs when they see the majesty and the sheer number of architectural gems that were razed, reduced to a pile of debris at the local landfill. Fortunately, the majority of those dwellings were lost pre-1980. By the 1980s, most communities realized that in destroying architecturally significant properties, they were ripping out the very soul of their community and the beating heart of their history, and the wanton destruction stopped. That’s one of 27 reasons it surprised me to hear that the L. M. Callis house is facing the gallows. This is 2016. We know better than to continue tearing down these irreplaceable gems. Perhaps the Arts Center needs to see these old houses as I see them: Breathtaking massive sculptures, painstakingly carved out from Cypress, Cedar, Oak and Pine. These glorious and massive wooden sculptures come with this immeasurable bonus: We can live within them, and experience these glorious artistic forms from the inside-out. In my opinion, tearing down a grand old house is no different from purposefully destroying historic artwork. And don’t get me started on the recycling issue. More than 40% of all the detritus in American landfills is construction debris. So while the Arts Center may place a few recycle bins at their shiny new facility, is that really going to counteract the effect of sending 350,000 pounds of irreplaceable first-growth lumber from virgin forests to the landfill? Please share this blog on your Facebook page. To read more about why this wood is irreplaceable, click here. To learn more about why you should not destroy “good old work” click here. Thanks to Lori Jackson Black for supplying the photos. 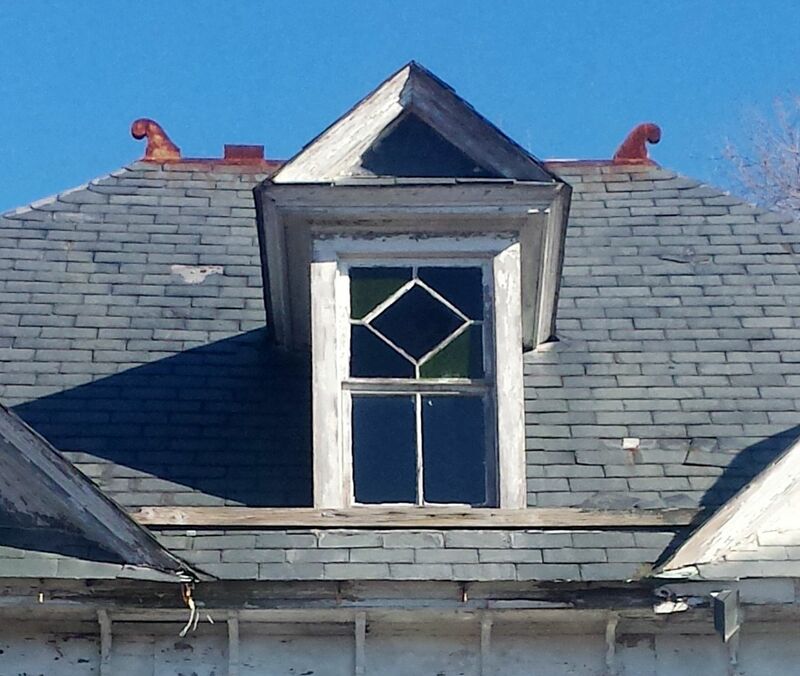 This old house was built by local merchant, L. M. Callis, and it's located behind the Bay School Buildings. Yeah, that is slate on the roof, and most likely, it's Buckingham Slate, considered the finest roofing material in the world. Photo is copyright 2016 Lori Jackson Black and may not be used or reproduced without written permission. Buckingham slate is mined in Buckingham County (hence the name) and weighs about 1,400 pounds per square. You heard that right: A 10x10 section of Buckingham slate weighs 1,400 pounds. Houses built to receive this roof would have been overbuilt to accommodate the phenomenal weight of the roofing shingles. Photo is copyright 2016 Lori Jackson Black and may not be used or reproduced without written permission. 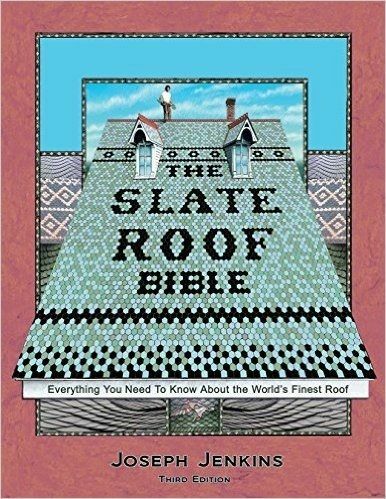 In this wonderful book, Mr. Jenkins explains that Europeans don't tear down things like we do, and there are slate roofs in Europe that are more than 400 years old. Slate roofs need maintenance but they need never be replaced. Remember I mentioned that 40% of all materials at landfills are construction related? About 35% of that is roofing materials. Slate roofs are forever and they are the "greenest" roof you can possible use. And you'll note, the house has slate on the gables as well. 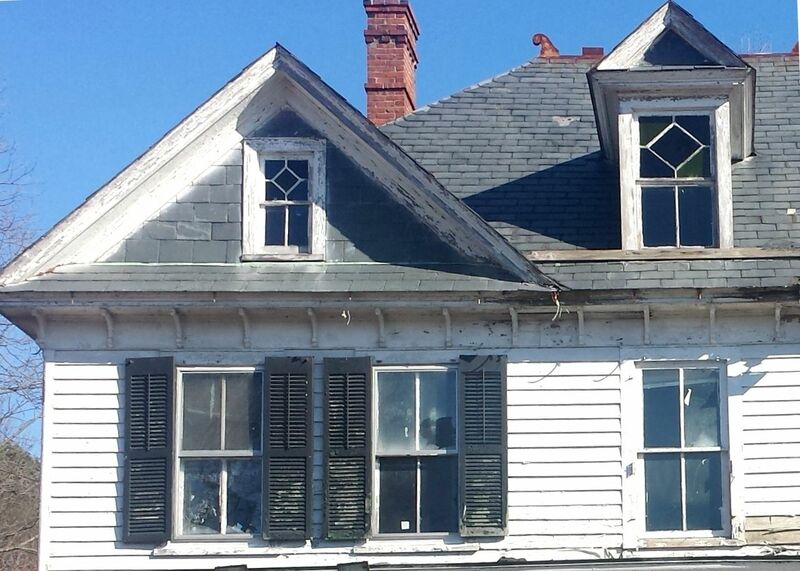 Perhaps most incredibly, 105 years later, this house still retains its original windows, siding, roof and even shutters. They appear to be original. I'd guess that the clapboards and shutters are cypress or cedar, both of which are "oily" woods and will last for a long time. Photo is copyright 2016 Lori Jackson Black and may not be used or reproduced without written permission. This house deserves a better ending, than being reduced to the "demolished houses" vertical file at the local library. Photo is copyright 2016 Lori Jackson Black and may not be used or reproduced without written permission. I could talk for a long time about this house, but I'll stop here: It's a stunning house and is worthy of restoration. Photo is copyright 2016 Lori Jackson Black and may not be used or reproduced without written permission. That house was built to last. True it will need repair. I would rather see the house get repaired rather than it be demolished. They should put money into fixing up the house rather than to tear it down. With proper care, the house could easily last another 100 years. Though I never knew his grandparents, I know the house holds many memories for my husband. Not only for him but for many in the county who visited or stayed at the home of Mr. and Mrs. Callis. I hate to see such a part of history demolished. It would be so nice if it could be saved. That was my grandparents’ house. I spent my first three years of life there until my parents’ house was built in 1950. Thank you for what you said in this article. I hope it will inspire others to work together and save this house. When it was built, every room was heated by a fireplace. By the time I was born, those fireplaces had been covered, and an oil furnace had been installed in the old coal room. And, by the time I was born, they’d added indoor plumbing but there was still an outhouse on the property. Also, there was a small house behind the big house, which was a cook house, I believe. Later on, it was used for storage. As a child of seven, during an exploration of one of the sheds, I discovered wrought-iron markers, claiming that this was a property of the Confederate States of America. Please - anyone who is interested - contact the Bay School and ask them to consider an alternative to demolition. 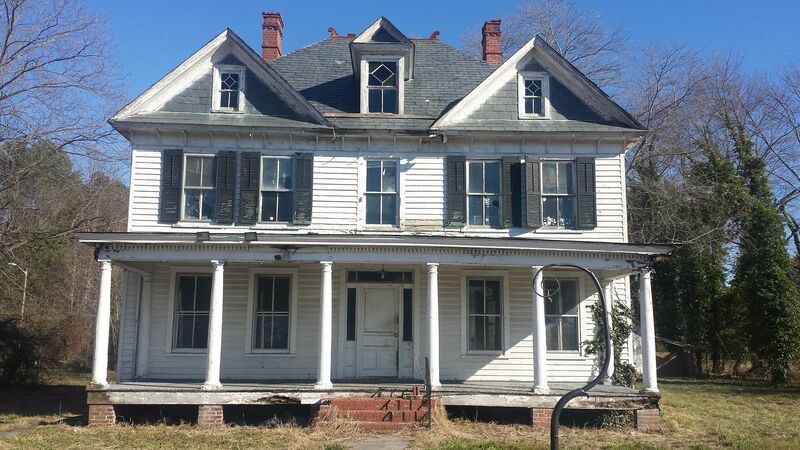 This house was saved; it is now a The Callis House Inn on Main Street, Mathews County Va! I see it almost every day and am so glad that it was saved! The Croydon: A Spanking New Outlook! And Then Jennifer Found an “Ellison” in Hershey, Pennsylvania!